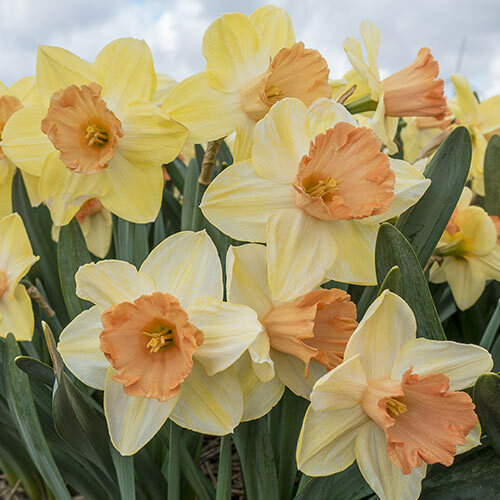 Is there anything finer than a springtime garden filled with fragrant daffodils? Not in our book. We love this new variety for its unique coloration and intense perfume. Tickled Pinkeen features big 4½" flowers with gorgeous, greenish-yellow perianths highlighted by large pink cups. The flowers reliably emerge from mid to late April for a mid-spring display that can't be beat. Your customers will love its dependable nature, easy growth habit and exotic good looks. Suggest Tickled Pinkeen for seasonal borders, mixed beds and decorative container gardens. Sturdy 14-18" stems make it ideal for cut-flower bouquets and arrangements. Plus, they keep the blooms upright and visible, even through wind and rain. This is a born naturalizer that returns year after year with even more beauty and vigor.